20. 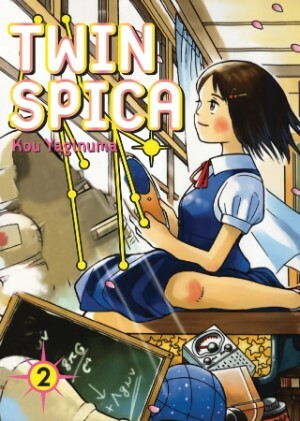 Twin Spica (Kou Yaginuma) - The manga that starts out my list has a retro feel to it, following a rather innocent protagonist who dreams of one day traveling to the stars, and so she enrolls in the Tokyo Space School, where she will be prepared for her chosen field. This book has a gentle, often melancholy quality to it, as Asumi is faced with plenty of obstacles and hardships. Yet she is constantly surrounded by people who watch out for her and makes friends as she goes along, drawing people to her with her caring nature and determination to see her dreams come true. 19. X'd Out (Charles Burns) - The first volume in the new comic book that Charles Burns is creating sees Burns experimenting with the medium in a David Lynch-like, unsettling story that bounces between three different narratives that seem to follow one character as he's: young and rebellious, a little older and weening himself off of pills, and as he traverses a more cartoony landscape as a Herge-inspired character while he's dreaming/hallucinating. Probably. Either way, it's quite a trip to read, even if it is disorienting and nightmarish. That's what Burns does best anyway. And this time around, we get it in full color. 18. 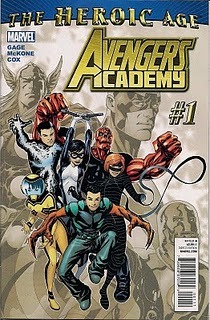 Avengers Academy (Christos Gage & Mike McKone) - The best Avengers title out there consists of a cast of new characters who have been experimented on by Norman Osborn, and now handpicked to be on this new team - not because they're the best and the brightest, but because they have the potential to be dangerous to society, and need to be tempered and perhaps defused. It's nice and refreshing to have a whole new batch of plucky characters to get to know in this bright superhero series, with a little edge, a little darkness to them. And these are some of the best character designs that I've seen in recent memory. 17. Black Widow (Marjorie Liu, Daniel Acuna, Duane Swierczynski & Manuel Garcia) - Beginning with a mystery that has its roots in the Widow's past, then diving head-first into a world full of espionage, back-stabbing and superheroics is this new Black Widow series. Liu makes Natasha into an interesting, very likable character, something that's often missing when it comes to the character in recent incarnations, and Liu also knows how to spin a good yarn with exciting plot twists. Swierczynski has picked up on what Liu has set up as he continues the series with dynamic secondary characters and riveting action. 16. 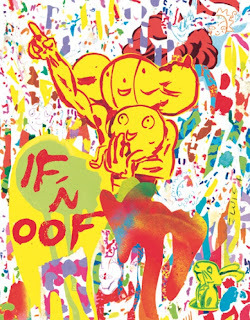 If 'n Oof (Brian Chippendale) - This thick graphic novel from Brian Chippendale features two lovable buddies as they maneuver their way through a very lethal landscape full of odd characters and creatures. The story is told with one panel on each page, forcing you to turn the pages feverishly in a comic that you just have to experience for yourself. It's often over-the-top, always unpredictable, and just plain fun. A whimsical adventure in a strange land. 15. Miss Don't Touch Me (Volume 2) (Hubert & Kerascoet) - The first Miss Don't Touch Me graphic novel placed quite high on my favorite comics last year, so it's really no surprise that the second volume reared its head here this time around as well. The husband-wife creative team return to Blanche, where they left her at a high-class bordello as the virginal stern headmistress Miss Don't Touch Me. This is a different beast than the first story however, without the murder mystery and origins into the shady business, although this one certainly delights in its own ways. Blanche meets a handsome eligible bachelor in her latest adventure at the same time as her mother returns to her life. Blanche is delighted with both relationships, however nothing is as it seems, and more mysteries await her as the story progresses and new facts come to light. 14. Artichoke Tales (Megan Kelso) - This multi-generational story follows the women of the Quicksand family, who carry on their apothecary business while a war is raging between the north and south. The war keeps lovers apart, causes tension in the family, and sees sacrifices along the way in what feels like a rather epic story. Kelso's simple lines beautifully capture the emotional turmoil of the characters and move the action along fluidly. This title caught me by surprise with how much I enjoyed it - it looks deceptively simple, but there's a lot going on in this ambitious book. 13. Smurfs (Peyo & Various) - Papercutz' reprints of Peyo's Smurf comics, which inspired the cartoon that millions have come to know and love, are the first time many readers have been able to read the Smurfs comics in America, including myself. I spent hours upon hours watching Smurfs on television on Saturday mornings growing up, but I had no idea that they'd been based on a popular Belgian comic until this archival project was announced. But the comics are every bit as magical and entertaining as I remember the smurfs from my childhood being, and are just a lot of fun to read as an adult. The way Papercutz is reprinting them, the original story that introduces the smurfs is actually reprinted in the second volume they've released, in The Smurfs and the Magic Flute. 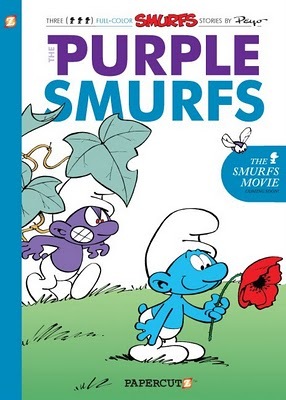 The first volume released is The Purple Smurfs, containing the classic story that the volume is named for, and perhaps the best story of the bunch. The Smurf King was also released this year, with more on the way. These are just great little stories surrounding the little blue guys who have a knack for finding trouble. 12. Underground (Jeff Parker & Steve Lieber) - This is a really exciting little action comic that follows two park rangers who catch some dangerous men hired to set off explosives in Stillwater Cave, and are driven deep into the cave to escape them in a desperate bid for survival. Along the way, they encounter walls of rock, high water and near misses in this fast-paced, claustrophobic read. I think that Steve Lieber's artwork is what really makes this book work. He had the experience on Whiteout and Whiteout: Melt to make a harsh environment come to life with the obstacles of making it look very cold, and also to make the art exciting when sometimes the pages would be just full of the white snow. Here, he brings that same sort of technique to life in the opposite manner, having to use the sparse light from the character's flashlights and flares to force back the deep shadows of the cave. It's a very dark book, lots of black, but the panels are expertly lit with shade. And the action is really intense and often brutal, so the story just flies by. Lieber paces the story with ease, drawing out tension, and making the protagonists' desperate plight come alive. 11. 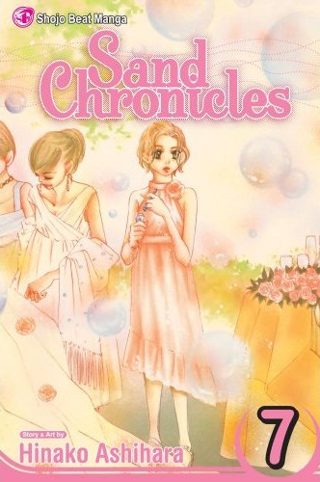 Sand Chronicles (Hinako Ashihara) - No book gets me more emotional than this shojo manga does. Every time I crack open a volume, it's inevitable that tears are going to follow. This smartly-written manga with troubled, fully-realized characters, follows Ann, whose mother committed suicide when she was young, and has had that experience hanging over her her entire life, sometimes subconsciously causing her to do things that hurt her or those around her, and sometimes making decisions that aren't necessarily the healthiest. Her story is full of love, loss, depression and feeling generally directionless. But just as fascinating as the places that Ann goes in this story are the back stories of the characters around her, all of whom have their own issues to contend with. The revelations keep coming as this series winds towards its conclusion, but this is one emotional roller coaster that I'm glad I had the opportunity to experience. 10. 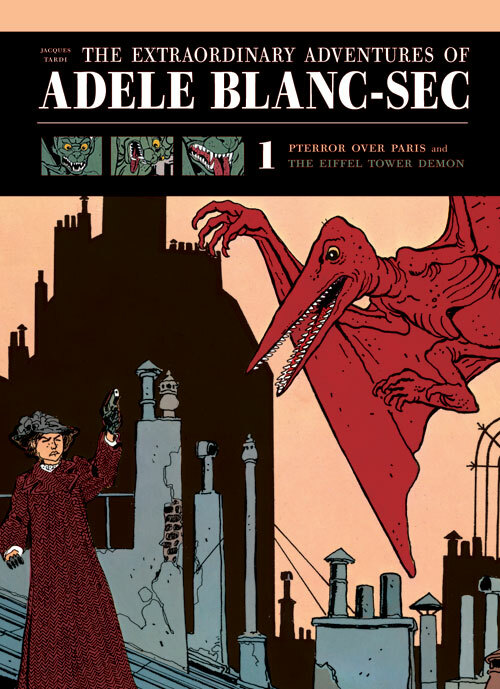 The Extraordinary Adventures of Adele Blanc-Sec (Volume 1) (Jacques Tardi) - A lot of people have been talking about Jacques Tardi's other work from this year, It Was the War of the Trenches, but I preferred this whacky book of mystery and double-crossing that collects the stories Pterror Over Paris and The Eiffel Tower Demon, both of which star the very capable Miss Adele. Adele is a fearless woman living in Paris in the early 20th century, plotting crimes for her own purposes and trying to uncover the insidious plots of others. This story is full of broad characters and is really silly, but it's a really riveting, often funny book that you can't help but love to spend time with, featuring some of Tardi's best art period. Plus pterodactyls in Paris! 9. Batwoman: Elegy (Greg Rucka & J.H. Williams III) - Collecting content from Detective Comics, this story features a gay woman who puts her military training to good use after she's booted out over "don't ask, don't tell." With some additional training and a little help from friends, Kate Kane becomes quite a force as Batwoman in this fun, dark story. This title features some amazing art from J.H. Williams III, which is the big draw here, with some really nice elaborately-designed splash pages. Rucka does an equally amazing job from his end, providing readers with a three-dimensional heroine to lead this action-packed title from the shadows of Gotham City. 8. not simple (Natsume Ono) - One of the best discoveries of the year for me has been Natsume Ono, as Viz has released a good amount of material from the artist this year, introducing the creator to American audiences with some fantastic work. 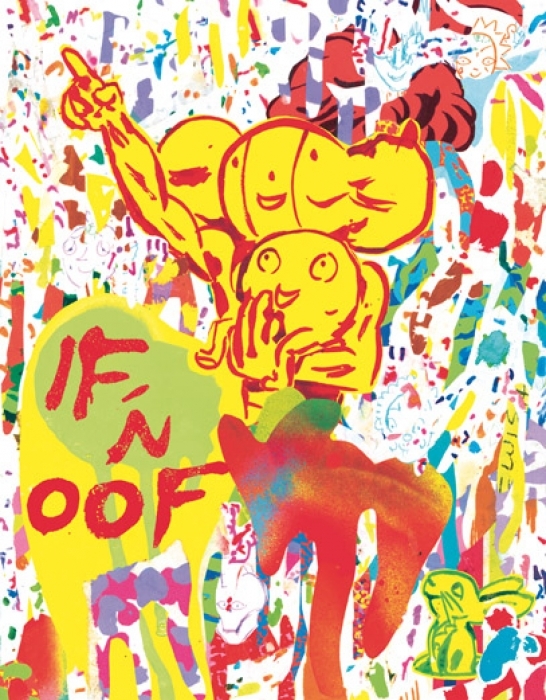 Ono's art is pretty stylized, probably in not simple more than any of her other works, featuring bug-eyed characters and simple cartoony lines. It doesn't look like anything anyone else is doing, but it looks really cool. Her storytelling is equally as enthralling. not simple tells the story of Ian, a strange, passive character who seems a little too innocent and naive, just going with whatever life throws his way. A majority of this book sees him trying to achieve a goal he's set for himself so that he can see his sister again, to fulfill a promise he made to her. But right away, things are fuzzy, as Ian himself isn't even sure if his sister is really his mother. And once a little inconsistency like that is examined, there are a lot of other revelations that follow suit, coloring in quite the unbelievable life for this soft-spoken guy. There are many shocking revelations, and interesting turns, in this highly emotional tale that often ventures into territory that's pretty depressing, but makes for a compelling story. 7. 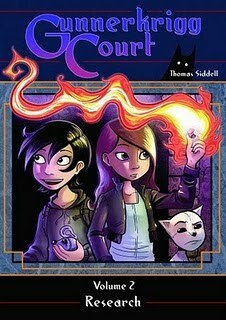 Gunnerkrigg Court (Volume 2): Research (Thomas Siddell) - This all-ages graphic novel began as a webcomic, but like other high quality material out there in cyberspace, made the leap to print, courtesy of Archaia. This is one of those books that really has something for everybody: magic, mystery, an epic scope, a demon-possessed toy cat and a great protagonist in Antimony Carver. Siddell has really grown comfortable with illustrating his world by this volume, providing some truly amazing artwork. And this second volume builds on the story and mythology established in the first book, bringing the thrills to new heights, while letting readers spend more time with the fun inhabitants of the dark hallways of Gunnerkrigg Court, and all of the magic and danger that lurks there with them. 6. Love and Rockets: New Stories #3 (Gilbert Hernandez & Jaime Hernandez) - The Hernandez Brothers' third annual release of Love and Rockets is their best yet. Gilbert Hernandez has long been a favorite artist of mine and he offers some pretty dynamic stories this time around as well, including another comic adaptation of one of Frtiz's "B" movies, "Scarlet by Starlight." While Gilbert's stories are high-quality offerings with fantastic art, it's Jaime who really stands out this time around. "The Love Bunglers" is a two-part story that follows Maggie as she goes on a few dates with a friend from the past, but the "Browntown" epilogue to that story is where Jaime really offers a show stopper. The tale is about Maggie and her family when they were younger and several life-changing events that occur to them that would shape their future. Jaime develops his characters effortlessly as he produces what may be one of the best offerings of his career. 5. Ayako (Osamu Tezuka) - My favorite manga of the year was written by the god of manga in the early 1970's, and follows a family in a post-WWII world. Clocking in at about 700 pages, this mammoth story has a little bit of everything in it: action, suspense, romance, mystery. Ayako is at the center of all of the action, a little girl born from the sins of her family and kept a secret, everyone turning their back on her in one way or another. While some members of the family have blood on their hands, some are guilty for their inaction, and this little girl grows up under horrible conditions to become a very confused, broken adult. This book goes to a lot of grim and dark places, but it's wildly entertaining as it moves along, providing a wholly satisfying story by its conclusion. 4. Castle Waiting (Volume 2) (Linda Medley) - The second volume of Linda Medley's Castle Waiting carries on where the first volume ended, at a castle taken over by a ragtag group of people, all doing their part to form a nice little community. This book is overflowing with great characters, the story unfolding cinematically to Medley's beautiful cartoony art. The domestic life that readers glimpse with these volumes is an absolute pleasure to behold, and I really enjoy the time I spend with the people in this title, as they explore the castle and unlock some of its mysteries while settling in. A real treasure. 3. S.W.O.R.D. (Keiron Gillen & Steve Sanders) - While S.W.O.R.D. 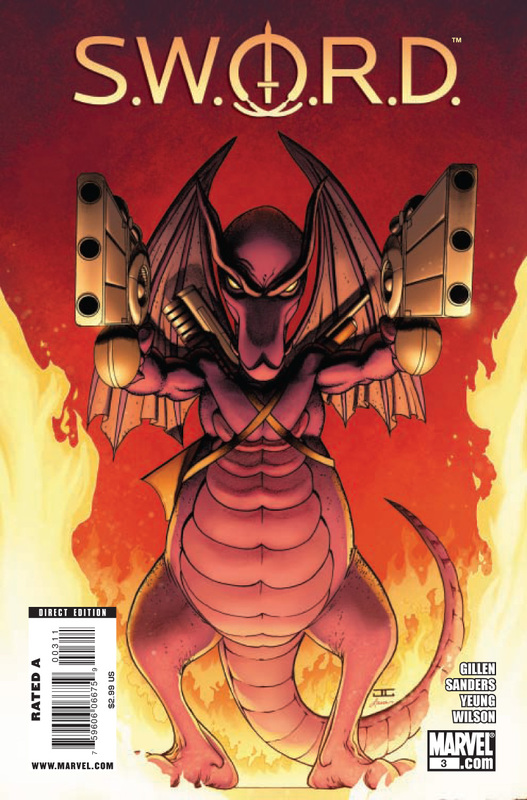 only lasted a mere five issues before it was canceled, it left quite the impression in its wake, and I would have loved to see where the creators would have taken things had it continued with what they'd set up. As is though, we get a wonderful story that follows an odd cast of aliens, mutants and humans who help Agent Brand run S.W.O.R.D. 's base, which is stationed in Earth's orbit, serving as protector for the planet, from alien threats. X-Man Beast and the alien Sydren provide comic relief, as does the bounty hunter Death's Head, whose battle with Brand and her friends is one of the best battles I've encountered in comics in recent memory. I think that what I love most about this title is the tone of the book, that perfect balance between humor and action, with great characters, that perhaps recalls some of the best early issues of the original Claremont/Davis run on Excalibur. 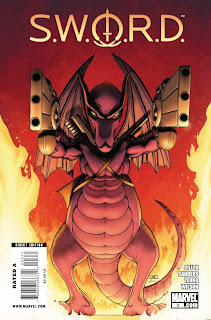 It's a perfect little story that has easily become my favorite superhero comic of the year. 2. The ACME Novelty Library #20 (Chris Ware) - The latest installment of Chris Ware's The ACME Novelty Library follows a character from birth to death, that of Jordan Lint, who is a minor character in the larger Rusty Brown saga. 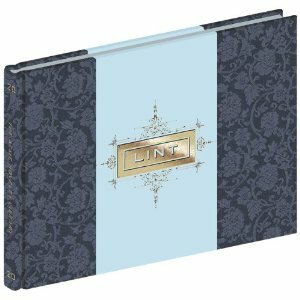 Lint is a pretty despicable character, making plenty of poor decisions throughout his life that come back to haunt him later. Ware masterfully develops this character, from the clever illustrations of his early memories, to his troubled childhood, to his latter years, where he reflects back on things we've seen earlier. Ware knows just when to bring up a memory or hint at a similarity to something from the past, or give a subtle reaction to something said, to make a very impactful scene that loads a page down with meaning. It's subtle and beautifully crafted, and in the end, you can't help but empathize with this horrible person as we see him develop through awkward moments and painful situations. Another winner from an amazing creator. 1. The Littlest Pirate King (David B. 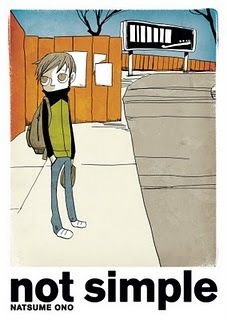 & Pierre Mac Orlan) - My favorite comic that I read this year is David B. 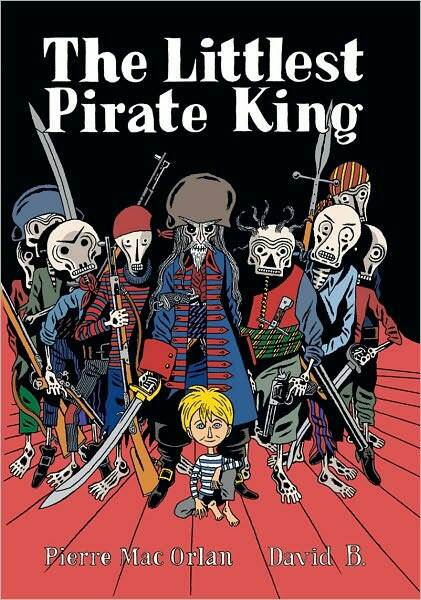 's comic adaptation of the prose story by French writer Pierre Mac Orlan. 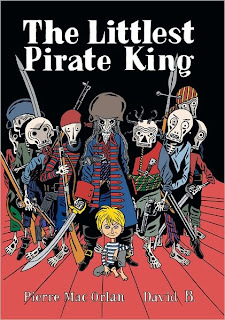 The story is a simple one, about a pirate ship manned by an undead crew, who wish for nothing more than to end their existence once and for all, that is until they come across a human child, whom they raise as one of their own and plump him up in preparation for the day they actually make him one of them. It's really David B. 's beautiful pencils that transform this story into something really magical. From the first scenes of the pirate ship cresting swirling waves, to the ship's trek underwater with all manner of sea creatures floating by, to the amazing designs of the pirates themselves, David B. elaborately illustrates this world with amazing mastery of the craft. The coloring, the pacing and panel arrangements, and the world of these pirates pillaging ships and being general menaces all make for a fun, engaging experience. This book contains some of the most beautiful panels that I've seen in years, and confidently sits at the top of my list for best of the year. And that's the end. Thank you for reading, and I hope I've pointed you toward some interesting works. Check out my best manga and superhero lists if you're looking for more recommendations, and I look forward to doing it all again next year.